In December 1992 the world lost one of the most beautiful creatures that ever lived. 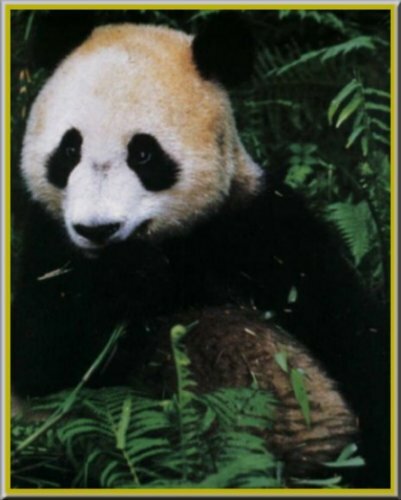 Ling-Ling, whose picture graces this page, and her mate Hsing-Hsing, were long-term residents of the Washington National Zoo. For 20 years panda lovers had followed their tragic courtship in which 5 cubs were produced, but for various reasons not one lived. It is common knowledge that pandas do not breed well in captivity and reproduction is extremely poor. When captive residence is long-term, cubs rarely survive. Why, then, do we keep placing them in captivity? Life for pandas in the wild isn't much better. There are now less than 1,000 pandas left living free. Their habitat is Sichuan Province in China. It is estimated that by the year 2025 there will be none left. Efforts are being made to try to keep the giant panda from becoming extinct, but it will be a fight. When Ling-Ling lost her life, I promised her in my heart that I would do all I could to keep her spirit alive and to do my part in the fight to save her kind. The giant panda isn't the only animal species on the road to extinction. The Bengal tiger, who resides in the Indian jungle, has dwindled to 2,300. The black rhino, living in the African bush, is down to 2,400. Neither of these species is expected to exist beyond the year 2025 either. The next page contains a photo which some may find disturbing, especially to children. But I'm a firm believer that education and TRUTH is the answer to the change that is needed to insure the survival of our endangered species. If you don't care to view the next page, but would like to do your part on behalf of Ling-Ling, Hsing-Hsing, their lost babies and all of the other creatures whose lives are at risk, there are links at the bottom of both pages to organizations which are fighting the war to save the Earth and its inhabitants. Our beloved Hsing-Hsing passed away on November 28, 1999 at the ripe old age of 28. It was with deep sorrow but also pride in the fact that he was well cared for that we bid adieu to the other half of Ling-Ling. I know that he is happily residing at Rainbow Bridge with Ling-Ling and their babies waiting for the day until their loving caregivers at the Washington National Zoo take their own steps across. In association with art.com, these panda posters may be purchased by clicking on the one you want. You will be linked directly to art.com. Any commissions I receive from the sale of these posters are donated to the World Wildlife Fund in memory of Ling-Ling. Every card sent by E-Cards results in a contribution to the World Wildlife Fund. Please use E-Cards for your greetings and use the link above. Thank You.